I have added this page for internet users who have become entangled in the Justice Everywhere Productions, LLC (a.k.a. 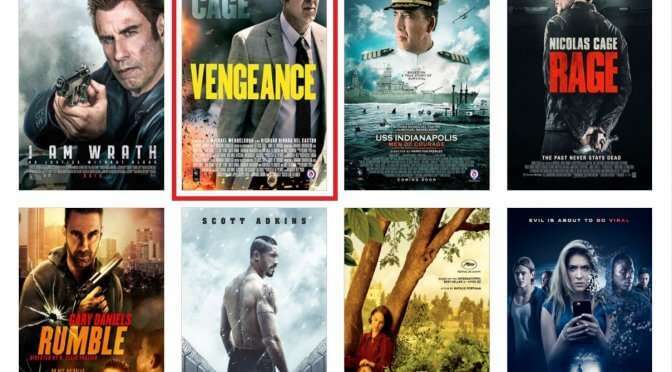 the “Vengeance: A Love Story (2017)”) movie lawsuit cases. The goal here is to keep up to date on this plaintiff, and to discuss their various cases. Should you learn of any updates regarding one of their cases, or you hear that a Justice Everywhere Productions subpoena has been issued to an ISP, please post it here using the following format — (e.g., “Justice Everywhere Productions, LLC v. John Does 1-20 (Case No. 4:17-cv-01363) filed in the U.S. District Court for the Northern District of Ohio”). Please also feel free to post new cases you find where Justice Everywhere Productions, LLC is listed as the plaintiff. 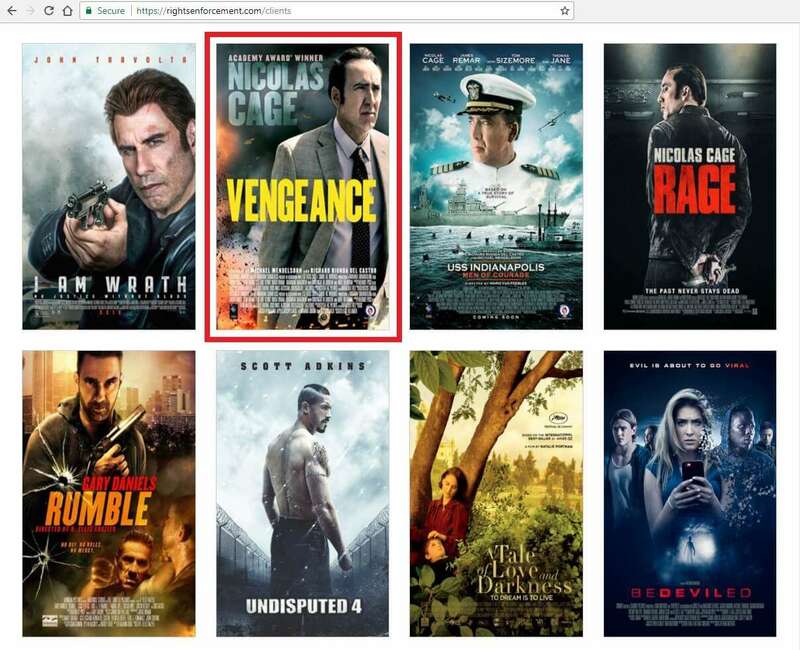 Justice Everywhere Productions, LLC is suing for copyright infringement based on the the illegal download of the “Vengeance: A Love Story (2017)” movie, starring Nicolas Cage. The lawsuits are all copyright infringement lawsuits filed in the Federal Courts, and each lawsuit sues for statutory damages of $150,000. Accused internet users [in receipt of Justice Everywhere subpoenas] are made aware of these cases when they are sent a letter from their ISP (e.g., CenturyLink, Comcast, Hawaii Telecom, Verizon Fios, Time Warner Cable, etc. ), which informs them 1) they are implicated as a “John Doe” Defendant in this case, and 2) the ISP is bound by a subpoena to share the account holder’s contact information (and relevant information about their IP address’ involvement in the case) on a certain due date unless the subscriber files an objection to the Justice Everywhere Productions subpoena with the court (referring to a “motion to quash“). Remember to please exercise discretion when posting (e.g., do not post your real name or e-mail address), and as usual, avoid using vulgar or offensive language (both towards the plaintiff and towards other users). [CONTACT AN ATTORNEY: If you have a question for an attorney about the Justice Everywhere Productions, LLC cases and options on how to proceed (even specifically for your case), you can e-mail us at info[at]cashmanlawfirm.com, you can set up a free and confidential phone consultation to speak to us about your Justice Everywhere Productions, LLC case, or you can call us at 713-364-3476 (this is our Cashman Law Firm, PLLC’s number]. [CONTACT AN ATTORNEY: If you have a question for an attorney about the Justice Everywhere Productions subpoena-based cases and options on how to proceed (even specifically for your case), you can e-mail us at info[at]cashmanlawfirm.com, you can set up a free and confidential phone consultation to speak to us about your Justice Everywhere Productions subpoena, or you can call us at 713-364-3476 (this is our Cashman Law Firm, PLLC’s number]. Here are the steps your attorney (us, or anyone else) should be taking on your behalf. Carl Crowell and his local counsel across the US (here in Texas, Gary Fischman) appear to be researching the claims and linking the accused IP addresses to determine whether that accused defendant has been involved in the download of other copyrighted films. They appear to be watching the activity of the IP address (specifically, before and after the date the ISP sends the subpoena notice to the account holders) to see if there is a change in the downloading activity of the accused subscriber. It is important to share truthful information with your defense attorney so that claims against you can be disputed with facts and dates. The plaintiff attorneys have data that they rely on, but their reliance on that data is based on a STORY which may or may not have an alternative explanation. Obviously, your attorney should have the common sense to discuss the claims in order to refute their story without admitting guilt on your behalf. STEP 3) DISCUSS AND NEGOTIATE SETTLEMENT OPTIONS WITH PLAINTIFF ATTORNEY, WHETHER BY PAYING A SETTLEMENT FEE, OR NO SETTLEMENT (PROCEED WITH LAWSUIT). Normally the plaintiff attorneys in a copyright infringement lawsuit (or more frequently, a bittorrent-based “copyright troll” lawsuit) will immediately approach a settlement regardless of guilt or wrongdoing. This is not always the case with the Justice Everywhere Productions, LLC attorneys, as they do not always offer settlements to accused defendants. The “no settlement” letter option is obviously the scenario where the client did not do the download, or the plaintiff attorney was unwilling to come to an amicable arrangement. Obviously if neither side can agree on an early solution to the problem, then yes, it makes sense to proceed to allow the plaintiff attorney to name and serve your client, file an answer with the court, and proceed with defending your client’s interests in the courtroom. Many accused defendants downloaded the copyrighted movie not realizing that the download was illegal. This is because there is software (e.g., Popcorn Time) which, on its face, appears to be legitimate. However, unbeknownst to the end user, Popcorn Time uses a bittorrent backbone in order to acquire the file for the end user. It is here that the account holder gets ‘caught’ downloading the video, because his/her real IP address is exposed as the Popcorn Time software joins one or more bittorrent swarms in order to acquire the video. Unfortunately, it is not always known whether a software source is legitimate or not. For example, as far as I understand, the videos presented on the Popcorn Time software are usually pirated, and downloading the videos or viewing the videos can get the end user sued for copyright infringement. Contrast this with other movie sources, e.g., Netflix, Amazon Prime, Hulu, etc., these are legitimate. However, there are many “in between” software platforms and websites which appear to be legitimate, but may not be. Most notoriously – Crackle. So far, to me it looks as if Crackle movies are legitimate and can be viewed without being sued for copyright infringement, but I could easily be wrong and we will not know this until the lawsuits start flying. Regardless of the intention of how the video was acquired, downloaded, or viewed, this is our goal — to have the circumstances of the accused defendant be relevant and useful in a negotiation with Justice Everywhere Productions, LLC to arrive at a settlement price the client can afford. Obviously this is not a preferred outcome, but it still must be considered. If an attorney is unwilling to settle (or if he or she is being unreasonable in settlement negotiations, e.g., asking for too much money, or requiring the client to take some action outside negotiating a settlement agreement), there is another alternative strategy. Have your attorney file an answer on your behalf, admit guilt to the claims of copyright infringement, and argue for what is called “minimum statutory damages” of $750 plus the other side’s attorney fees (which at this point would be minimal). While not a preferred alternative, it is a method of forcing a reasonable settlement amount upon the plaintiff attorney if the download actually occurred. STEP 5) NEGOTIATE TERMS OF SETTLEMENT AGREEMENT. The settlement agreement should be specific to the claims of copyright infringement, and they should include the nuances of contract law in order to ensure the agreement is enforceable. The terms should not ‘admit guilt’ on behalf of the client, and the scope of the contract should include not only the accused defendant (the account holder), but also the household and/or family members. There are other crucial elements to have in a settlement agreement (e.g., attorney fee shifting specific to copyright infringement lawsuits), but the above should be sufficient. This is self explanatory. Justice Everywhere Productions, LLC is not bound to an agreement until they sign it (or until their attorney with authority to sign signs it on their behalf as their agent). Attorneys generally try to get the John Doe Defendant to sign first and pay their settlement fee, and then ‘maybe’ the plaintiff attorney will sign it, and ‘maybe’ the attorney will accept the payment, and ‘maybe’ the attorney will release that defendant from liability once the settlement is received. These are games a plaintiff attorney may play, and for this reason, it is advisable to have the defense attorney insist that the plaintiff attorney sign the agreement first in order to bind their client to the terms of the agreement… before their client signs the agreement or pays a penny in settlement of the claims against them. The reason for this is because once their client has their money, without being contract-bound to release the defendant from the lawsuit (assuming the John Doe Defendant signed first), the John Doe Defendant who paid their settlement fee becomes a lower priority to the busy plaintiff attorney (who is juggling sometimes hundreds of defendants in multiple cases) who is more worried about the due dates for their other cases, or who is more worried about extracting settlements from other defendants. This is why it is important in STEP 6) for the plaintiff attorney to sign the agreement first. Any Justice Everywhere Productions, LLC “copyright troll” bittorrent-based copyright infringement lawsuit really revolves around the Justice Everywhere subpoena which moves from the court to the accused John Doe Defendants. Tracking a Justice Everywhere Productions subpoena can help an accused defendant understand the timelines of when they can fight, when they can settle, when they can ignore, and whether they are anonymous or not at each step. NOTE: I have moved the contents of this section to its own article, because the topic of “Subpoena Stages and Anonymity” is not limited to the Justice Everywhere Productions / “Vengeance: A Love Story (2017)” movie cases. Justice Everywhere Subpoena is first introduced to the court for approval. A Justice Everywhere subpoena is first introduced to the court when the plaintiff attorney files the lawsuit and asks the court for permission to obtain the identities of the various internet users accused of downloading Justice Everywhere Productions LLC’s “Vengeance: A Love Story (2017)” movie. Justice Everywhere Subpoena, once approved by the court, is sent to the ISP. The federal judge approves the Justice Everywhere subpoena (usually by rubber stamp), and the Justice Everywhere subpoenas are then sent to the “abuse” department of the various ISPs (e.g., AT&T U-verse, COX Communications, Comcast, etc.). These ISPs in receipt of the Justice Everywhere subpoena are ordered to hand over the accused subscriber’s information to the plaintiff attorney. They send a notice to the account holder that a Justice Everywhere subpoena has been received, and that they are under a duty to comply with the subpoena by a certain date unless the account holder files a Motion to Quash the Justice Everywhere subpoena before the arbitrary deadline they set (usually the deadline is 30 days from the notice sent to the subscriber). The ISP forwards the Justice Everywhere Subpoena to the accused account holder giving him a chance to file an objection with the court. You (the account holder) receive the notice containing the Justice Everywhere subpoena, and you learn that you are implicated as a “John Doe” (an unnamed defendant) in the Justice Everywhere Productions, LLC v. Does lawsuit. At this point, you are still anonymous. The ISP complies with the Justice Everywhere Subpoena and hands over your contact information to the plaintiff attorney. Assuming you do not file the Motion to Quash (there are many articles on this website explaining why you might not do so), the 30-day deadline set by your ISP will lapse, and your ISP will comply with the Justice Everywhere subpoena. They turn over your information to the PLAINTIFF ATTORNEY (but not to the court or anyone else). You are still anonymous. The exact moment your anonymity expires. At this point, the life of the Justice Everywhere subpoena is over, as it has served its purpose and the plaintiff attorney is in receipt of your contact information (and whatever other information your ISP was forced to hand over to it). At this point, you are a “John Doe” defendant in the lawsuit, and only your plaintiff attorney knows your real identity. YOU ARE STILL ANONYMOUS at this point (as to the court and the world, as the plaintiff attorney is not going to share your information unless he decides to name and serve you as a defendant in the lawsuit). Your anonymity expires once the Justice Everywhere plaintiff attorney realizes that he or she cannot get a settlement from you, and based on their evidence that you are the downloader of their “Vengeance: A Love Story (2017)” movie, they file an amended complaint with the court with your name as a defendant, and they serve you with a copy of the complaint. At this point, you have been “named and served,” and you are no longer anonymous. At this point, you need to decide whether it makes more sense to stand and defend against the claims against you (again, consider the attorney fees issue), or to negotiate a settlement and amicably step away from the lawsuit. NOTE: If you choose to fight, be aware of Prof. Matthew Sag’s paper entitled “Defense Against the Dark Arts of Copyright Trolling,” and the considerations surrounding using what are otherwise “valid” defenses to copyright infringement which likely DO apply to your case. In sum, about this article.